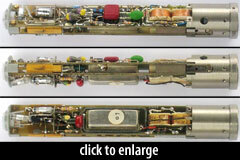 The KM88 was a small-diaphragm multipattern FET condenser mic. 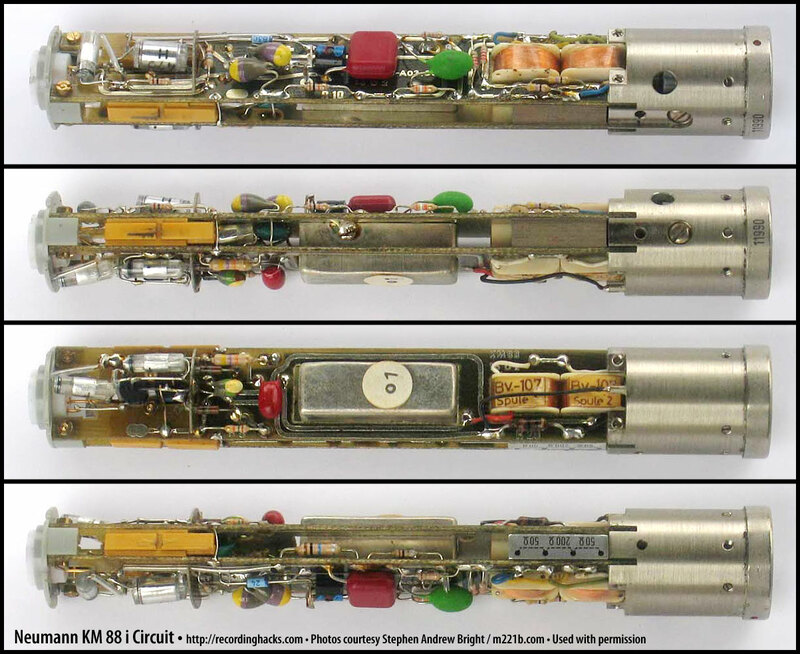 It was, in a sense, a solid-state version of the KM56. Both mics, along with the stereo mics SM2 and SM23, used the same basic capsule design — which itself was very similar to the KM54 capsule. 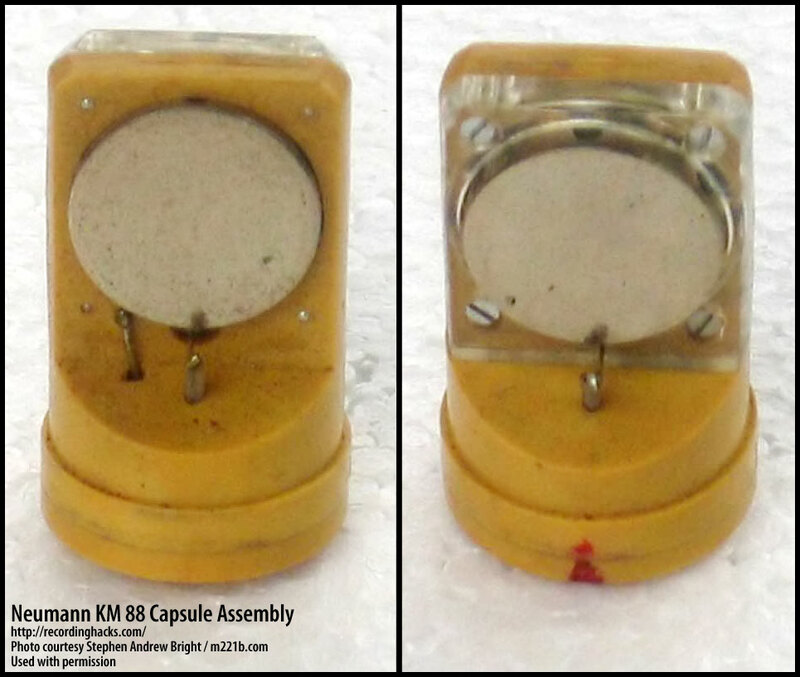 According to Klaus Heyne of German Masterworks, the FET KM88 was designed in order to use up the company’s surplus of these capsules. In the KM56 and KM88, a pair of small-diameter capsules were joined back-to-back with a gap between them. The gap was created to increase the time difference between the arrival of low-frequency signals at the two membranes. Typical dual-diaphragm capsules have a very small gap between front and back membranes. Long, low-frequency signals are nearly in phase at both diaphragms simultaneously. When the polarity of the rear diaphragm is reversed to create a figure-of-8 pattern, the resulting low-frequency response is attenuated because the two signals — reversed in polarity but nearly identical in amplitude — cancel out. The diaphragms in the KM56/KM88 capsule are made of 0.7-micron nickel — approximately 1/10 the thickness of typical (~6-micron) condenser capsule membranes. The initial design of this capsule used a relatively loose diaphragm tension, and was subject to damage from high SPLs. …[When] the diaphragms were repeatedly overloaded with SPLs to a point that the metal diphragm bottomed out against the electrically charged backplate, a tiny (arc) hole [can burn] into the diaphragm at the point of contact. 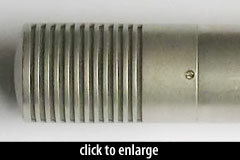 In 1982, Neumann changed the tensioning of the nickel diaphragm, in order to make the capsules more durable in close-miked vocal applications (such as German broadcast). This change altered the frequency response of the microphone — specifically, in Cardioid and Figure-of-8 patterns, low-frequency response was lost — 5dB @ 40Hz in Cardioid, and ~11dB @ 40Hz in Figure-8. See the frequency-response graphs below. 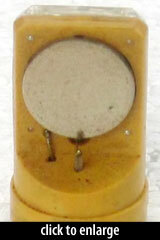 A switch on the microphone body enabled selection of Cardioid, Omni, or Figure-of-8 patterns. In Cardioid mode, the rear capsule was disconnected from the circuit. 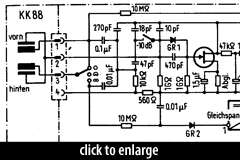 Nonetheless, the amplifier circuit maintained sensitivity and noise figures across all three patterns. The output circuit used Neumann’s BV-107 transformer (also found in the KM 83, KM 84, and KM 85). Strengths: super fast, yet musical, full figured performance with nice reediness in the mids. No deterioration in [signal/noise] when using figure-eight or omni. Solid output, due to DC converter which primes the nickel capsules to their ideal [polarization] voltage charge. Weaknesses: super-fragile nickel capsules with tendency to develop arc holes from contact between metal diaphragm and metal backplate. Beautiful head basket design which is too fragile to withstand even slight stress, forcing the vertical support struts to break and the head frame to separate from the rest. Not a single spare (including housing parts) available from Neumann anymore. KM 88 - a special-order version with a male 3-pin connector compatible with “Binder 09-0006-00-03 or Tuchel 3261001 female connectors” (165mm length). KM 88 i - Standard version with 3-pin male XLR connector (170mm length). KM 88 i mt - 3-pin male XLR connector, dark matte finish (170mm length). The KM88 was discontinued in 1986. 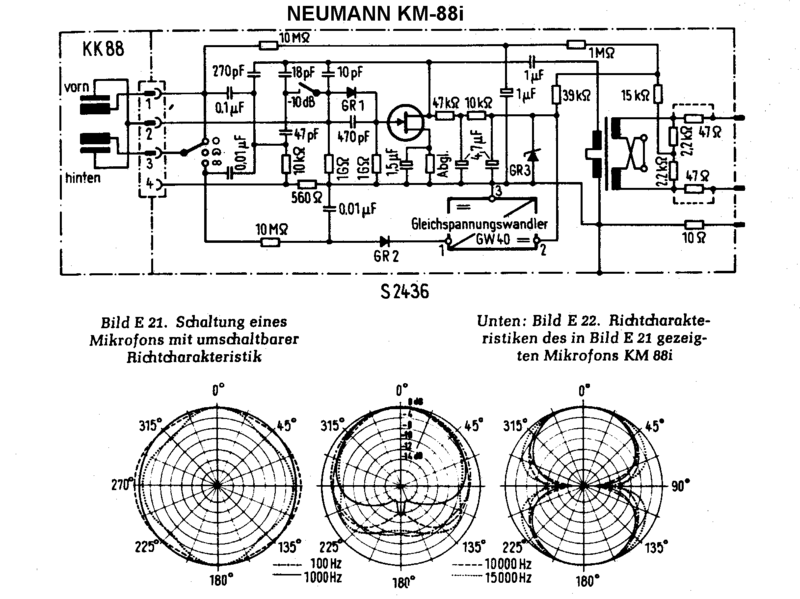 The Neumann KM 88i is also known as: KM 88 i, KM 88 i mt. The mic was released in 1969.